The open face spinning reel offers a rig for all types fishing. Because of its versatility the open face spinning reel has became very popular among anglers. With rod and reel combos ranging from ultra lights to heavy duty surf fishing, the open face spinning reel offers a rig for all types of targeted fish. Unlike the conventional reels which employs a revolving spool when casting and retrieving, the open face has a stationary spool for line storage. One advantage the stationary spool provides is the line stops uncoiling once the cast is completed. This permits backlash free operation and allows beginners of all ages to master the open face quickly. The rod and reel configuration of the open face has the reel mounted on the underside of the rod and the rod generally has a longer handle with a larger lead guide eye. 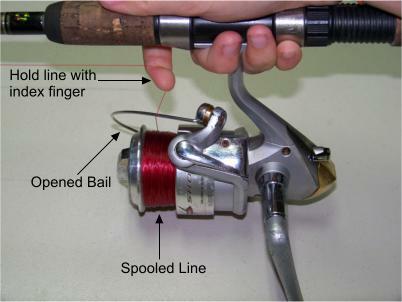 To make a cast with the open face spinning reel, grip the reel with two fingers on each side of the post. Hold the line with the index finger and use the other hand to open the bail, freeing the line for the cast. Swing the rod in the direction in which the bait is intended to land while relaxing the index finger allowing the weight of the bait or lure to uncoil the line. If there is a need to control the distance of the cast, finger the line as it uncoils from the spool. Once the cast is complete, the bail can be closed by rotating the reel’s handle or closed by hand. The line can now be retrieved when desired. One thing that needs to be noted about an open face reel is its design which allows the reel’s handle to rotate either clockwise or counter clockwise. An anti-reverse lock or switch usually located on the back of the reel should be set to permit rotation in only one direction (clockwise). Normally there is no need to turn this anti-reverse lock off. Some anglers have made the mistake of spooling the line backwards onto the open face reel because the anti-reverse lock was off. The drag on all reels is a function of resistance. Resistance to how much strain is necessary to pull line free off the spool. This prevents the line from breaking while causing the fish to exhaust itself as it is being reeled in, creating that exhilaration all fisherman seek. Having a workable drag setting is absolutely essential for the peak performance of any reel. The drag setting mechanism for an open face reel is located forward on the spool. The drag should always be adjusted when the reel is spooled with new line. 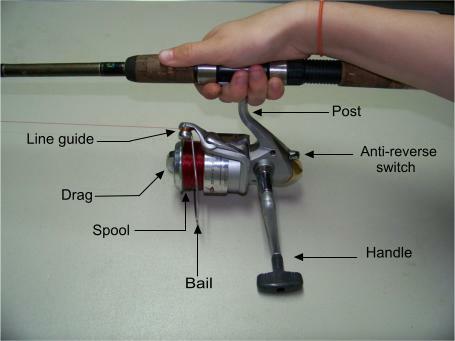 Additionally, the drag has the tendency to become sticky when the reel has been stored thus, the drag should be checked every time "before" the first cast. In the real world of fishing, setting or checking the drag for most anglers means grabbing the line just forward of the reel and giving it a good strong pull. Experienced anglers develop a "feel" for the drag setting they prefer. For the less seasoned however, Fishing-Tips-Bait-Tackle.Com recommends keeping the drag a little lighter until that "feel" is acquired. All open face spinning reel should be labeled with the recommended line size. The ultra light version often hold about 100 yards of 2 to 4 pound test line and cast lures as light as 1/16. Freshwater to light saltwater reels use line ranging from 8 to 20 pound test and hold about 200 yards. While some heavy duty surf reels will hold 250 yards of line with strength as high as 40 pound test and can easily cast 6 ounces of weight. When purchasing an open face spinning reel; generally, your best value is to purchase rod and reel combo . Most often these combos have a good reel to rod match and come in a wide variety. However, we recommend combos which do not come pre-spooled with line. Check the reels recommended line size and pick-up a good quality line, this will promote smooth tangle free casting. Another thing to consider before making a purchase includes the type of fishing one may try. For example, fishing in brackish to salty waters for red fish, stripers, or flounders, a medium saltwater combo with 12 to 14 pound test should be good. If casting a light beetle spin for bream, crappie, or other pan fish, an ultra light combo would make things exciting. For most however, the typical open face reel combo with a medium action rod and 12 pound test line is the ticket. Some problems anglers encounter with open face spinning reels often comes from unfamiliarity with the gear, such as putting to much line on the spool which could cause line tangle when casting. There is no need to fill the reel completely full with line since in most cases only about 40 to 50 yards of line ever touches the water. Secondly, an angler may spool the line on the reel incorrectly. Check our page on fishing line for advice on putting the line on the spool correctly. Finally, if the line has a tendency to twist and tangle during your type of fishing try using a swivel or a leader with a swivel, this should help. See more at How to Rig a Spinning Rod.